So the Turtles and Splinter accompany April on her trip to the Lost Island. O’Neil is uncharacteristically upset with the guys for following her and she yells at them. Splinter tells the Turtles to calm down – perhaps they’ll find what is drawing April to the island once they reach their destination. Upon landing, April sets off on her own, as the TMNT promised not to follow her around once they arrived. O’Neil heads off into the jungle, but Splinter tracks her, as he had made no promises. An angry storm moves in as the Sensei heads out to see what April is up to. Soon enough, O’Neil stumbles upon a palace in the thick jungle. April continues to say “maiest” as she walks into the building. The reporter finds a body of a woman wrapped in bandages and encased in a glass sarcophagus. Suddenly, a huge lightning bolt rips through the roof and strikes the casket, awakening the prisoner within. April asks who the woman is and she declares that she is April’s ancestor, May East, who was imprisoned here one thousand years ago, awaiting a kin member to set her free. April faints at this news, and May East puts the reporter into a chair and connects some sort of strange apparatus to her head. Master Splinter arrives and demands that May East set April free. Of course, East has no plans to do so, as she intends to use her psychic powers to drain April’s knowledge of the modern world so it can be conquered… and she promises Splinter that he’ll be next. Thus a fight breaks out. The two battle to a standstill – Splinter demanding April’s freedom and May East declaring that she will keep April asleep for one thousand years. At that moment, the TMNT arrive. They distract May and April wakes up. Splinter frees his friend from the psyche-draining helmet and the Turtles corner East. April’s ancient ancestor grabs a bottle and drinks from it, which transforms her into an armored cyborg that grows to towering proportions. 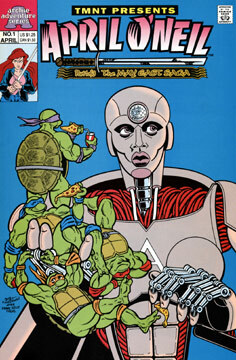 The TMNT rush outside and attack the giant robot, but they’re unable to dent it. Inside the palace, Splinter asks April to drink from the same bottle to awaken her own latent powers – April scoffs at the idea, but she tries nonetheless… and also grows into a giant robot! April attacks May and defeats her – but before O’Neil can deliver the finishing blow, both cyborgs revert to their human forms. May East fless back to her palace and seals herself inside. Splinter declares that the battle is done for the day, but they will face May East again. With that, our heroes pile into their hovercraft and head for home.